The Tree Mount Kit is used to mount the NPS Spot in a tree to create moon lighting effects, to light high canopies or for high-level cross illumination. A cable connection can be made at the rear of the dome. The Kit consists of a mounting dome and three special 316 stainless steel lag bolts. 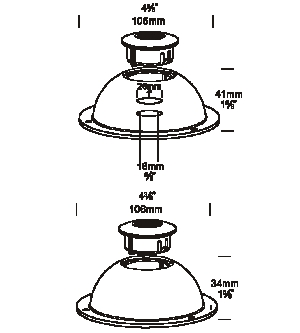 The bolts initially distance the dome 40mm (1 5/8") out from the trunk, which give the tree room to grow without causing any harm. The Tree Mount Kit is constructed from black UV stable glass filled polypropylene. There is sufficient space for a cable connection under the dome. An alternative mounting option is the Tree Mount Kit Rubber Strap. The kit consists of a mounting dome and a one meter adjustable rubber strap, which expands as the tree grows.